Chance is an outstanding example of the sportsmanship, competitive spirit, and genuine commitment to hard work, family and community that we wish to honour with the Adrian Campbell Scholarship. 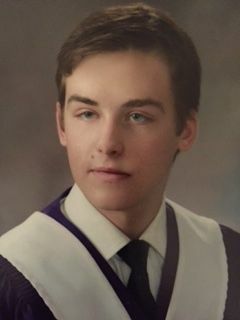 In addition to being a consistent Honours student and Student Council president, Chance is an accomplished runner with awards including Male Athlete of the Year, Team Player of the Year, Coach’s Award and this year he was awarded the Nova Scotia Sports and Athletic Foundations Exemplary Participation Award. He has also won a Cape Breton Naturalists award and a Gold Medal in the Environmental category at the 2016 Science Fair. Chance volunteers at the local foodbank; he is active in 4H and the Building Futures for Youth Program. Chance’s interests vary from making maple syrup, welding, and small engine projects to leadership roles in sport and student government including help in organizing the school’s annual winter carnival and Christmas food drives. Chance is a role model for young athletes and highly respected among his peers. Chance will be commencing a Bachelor of Science degree at UNB in 2018. We are proud to have Chance as a recipient of the Adrian Campbell Scholarship. Noah combines a passion for sport and learning with an understanding that striving for one’s personal best is the optimum path to success. He is known for his respectful and kind manner. He exemplifies the self-discipline, work ethic, sportsmanship and valuing of family and friends that Adrian held dear and that the Adrian Campbell Scholarship seeks to encourage. Noah prefers to lead by example and from ‘behind the scene’. He has given generously of himself to improve the lives of others. Through his film and video editing, Noah has helped to raise money for clean drinking water in Kenya as well as creating a promotional video for the Windsor 5 km run that raises funds for local youth running and recreational programs. Throughout high school, Noah has consistently achieved Honours; he is passionate about running; he was on the 2017 Canada Games Track and Field team; he has attended Nationals twice, last year won the 400m at the Nova Scotia School Athletic Federation provincials, and he holds the current provincial record in Hurdles. Noah has been recruited by the Dalhousie University track team. At Dalhousie, his goals include a possible future in law or journalism. We are very proud to have Noah as a 2018 recipient of an Adrian Campbell Scholarship. Anya combines a passion for sport and academics with leadership, hard work, and respect for others – qualities we wish to support with the Adrian Campbell Scholarship. Anya is a fully bilingual High Honours graduate of the French Immersion Program. Anya’s accomplishments include representing NS at three Canadian Eastern Skiing Championships and at the 2015 Canada Winter games. Anya also represented NS at several Canada Cups and the 2017 Canada Summer Games in Mountain Biking. She has volunteered her time as a ski coach in the children’s program for the Martock Nordic Ski Club as well as helping with the coordination of the Cyclesmith Short Track Series at Seaview Park. She led and advised a highly successful Fashion Charity Show at her high school, and has provided free tutoring to other French Immersion students. She is recognised for her intelligence and critical thinking, her honesty and humility, as well as her kind, encouraging and enthusiastic demeanor. Anya will be starting a BSc in Psychology (Neuroscience) at Bishop’s University. We are honored to have Anya as a recipient of the Adrian Campbell Scholarship. Will exemplifies the energetic, kind, dependable and highly motivated student we wish to honor with the Adrian Campbell Scholarship. Will graduated with Honours with distinction. He excels in Swimming, Volleyball and Cycling. As a member of the Wolfville Tritons Swim team, Will holds the provincial record in the 4x100 meter Freestyle Relay and is an Individual winner of the Junior Provincial Swim Meet. He has competed in both Road and Mountain Biking and won the Bicycle NS Bronze Medal for U-19 Cross-Country Mountain Biking in 2016. He was 2016 Captain of his high school D1 volleyball team. Will has been a volunteer buddy at Rising Sun Camp for children with special needs; he helped organize the first Henry Schein Cares event (free dentistry) in Kings County, and has volunteered at numerous cycling events throughout the province. Will is recognized for his energy, positive outlook, and willingness to help others. Will begins his Engineering degree at Queen’s University in the fall. We are honoured to have Will as a recipient of the Adrian Campbell Scholarship. Adam exemplifies the talented student athlete, work ethic, and personal qualities we wish to honour with the Adrian Campbell Scholarship. Adam is an outstanding role model – he is well recognized for his consideration and respect for others. Adam has maintained Honours with Distinction throughout high school; he has won seven school sports and sportsmanship awards; he is a highly competitive member of the NS Provincial Junior Triathlon Development Squad with hopes of competing at the 2017 Summer Canada Games; and he has generously volunteered his time in coaching youth in golf, cross country, track and field, and hockey – sports in which he has also successfully competed. In addition, Adam is the top ranked chess player for all ages in Atlantic Canada, and eight time national Grade Champion. He also plays trumpet in the Central Kings school concert band. Adam sets a high standard for sportsmanship, community involvement, and living life to its fullest. Adam plans to pursue Bio-Medical Engineering at Acadia University. We are very proud to have him as the 2016 recipient of the Adrian Campbell Scholarship. Liam represents the highly motivated, well-rounded and community spirited qualities we wish to recognize with the Adrian Campbell Scholarship. During his three years at J. L. Illsley, Liam maintained Honours with Distinction (French Immersion), played the bass guitar in the School band and received the MVP Award for the school’s Varsity Alpine Ski Team. Over the past 5 years, Liam has attended many National and International cycling events, including Mountain Nationals, Road Racing Nationals, Track (Velodrome) Nationals, and The Verge New England Cyclocross Series. He owns his own business in landscaping and snow removal working for many elderly clients who need assistance in his neighbourhood. Liam volunteers his time as a youth coach and mentor. In September, Liam will enter Dalhousie University’s School of Engineering. Liam’s future cycling goals include representing Nova Scotia at the 2017 Canada Games. We are proud to have Liam as the 3rd recipient of the Adrian Campbell Scholarship. Ben embodies the qualities of sportsmanship, academic success, and commitment to family, friends and community that we wish to support with the Adrian Campbell Scholarship. Ben has maintained Honors throughout his high school years. He is recognised for his hard work, for his leadership by example and his dedication to all his activities. Ben has been a volunteer at the Wolfville Food Bank Christmas and spring food drives; he has worked with the Acadia University summer hockey camps where he mentors and coaches children in the fundamentals of the game. He is an accomplished cyclist and hockey player, as well as a snowboarder, baseball player, and golfer. Ben’s goal is to compete on both the Nova Scotia Canada Games Road and Mountain Bike Cycling teams in 2017. This year he was unanimously selected to receive the coach’s award as well as MVP in hockey and was chosen as one of Norco Bicycle’s junior ambassadors wherein he promotes cycling with youth and helps with fundraisers and trail maintenance. Ben will starting a Biology degree at Acadia University in the fall with the plan to enter medicine. We are proud to have Ben as our second recipient of the Adrian Campbell Scholarship. Kali exemplifies the highly motivated, joyful, and well balanced life style we wish to honour with the Adrian Campbell Scholarship. 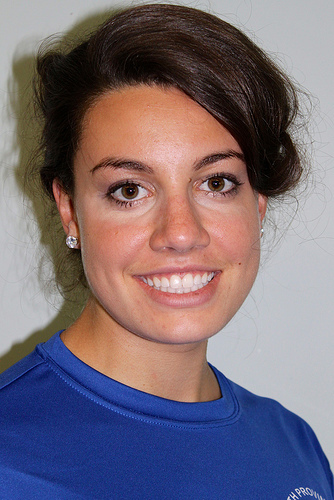 She demonstrates a commitment to excellence in her family, community, sport, and academic endeavors. Kali’s accomplishments include volunteering at the high school breakfast club, Special Olympics, Bedford Library children’s reading program, High Crest Nursing Home, and organizing the CNIB Merb Mile Fundraiser. She maintains Academic Honours while also pursuing her love of athletics. Kali has competed on the Dartmouth Crusader’s Competitive Swim Team, provincially in cross country track and field, and provincially and nationally on the Canada Games triathlon team. She was honoured with the Halifax Regional Municipality Citizenship Award in 2010 and was the spokesperson for the amateur radio club who communicated with astronaut Chris Hadfield on the International Space Station. We are proud to have her as the first recipient of the Adrian Campbell Scholarship.